For as long as we can remember, the quintessential Indian beauty has been defined by her long, thick tresses. Right from paintings of Goddesses, to matrimonial ads, to grandmothers eager to grow your hair with secret hair packs, those long, luscious locks have always been the ultimate Indian hair goals. Short hair, on the other hand, has been seen as ‘modern’, unconventional, and even rebellious. For years, your local aunty has been calling the pixie cut and the bob the ‘boy-cut’. Bollywood divas who chop off their tresses still make the headlines. And while it has become increasingly trendy in recent times (thank you, Airtel girl), it is still a hairstyle that Indian women tread cautiously to make their own. However, we have news for you. If you dig around a little in our history books, you’ll see that short hair was very much a part of our Indian hair heritage. The short bob was actually very popular with Indian princesses through history, who were celebrated as symbols of Indian femininity and grace. There seems to be a reason that the bob was a favourite amongst the royalty of India: we have a strong hunch that it may have something to do with its ‘classic’ quality. It also strikes a balance between practical and graceful, elegant and edgy. The bob was sported universally by a number of fashionable people, from Coco Chanel to Gayatri Devi, who, by the way, wasn’t the only Indian princess who favoured short hair. 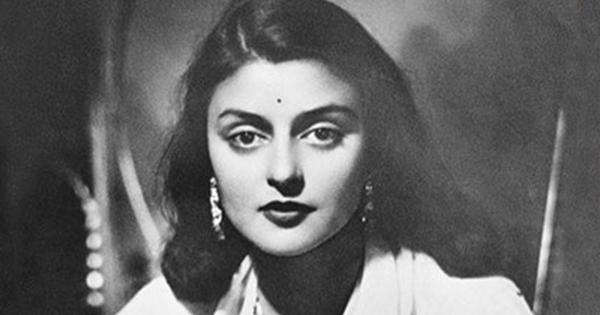 Gayatri Devi, one of Indian’s favourite style icons, was one of the first ladies to show that you can carry off short hair and a saree with grace. Her hairstyle allowed her the fluidity to switch from slim-fitting jodhpurs while horse-riding, to her chiffons and pearls while hobnobbing with elite gentry, with ease. Rukmini Varma, was blessed with more than royalty in her blood. Her great grandfather, Raja Ravi Varma, is considered the father of Modern Art in India. Surrounded by exquisite ancestral art, Rukmini took to the brushes. She painted controversial nudes and her hairstyles were as bold as her art. Pictured on horseback in her youth with the perfect shoulder length bob, later years saw her wear the fringe cut with tendrils on either side. From the Royal family of Bikaner, Princess Rajashree Kumari, the current heir, is a former shooter and Arjuna awardee. Childhood photographs show her confidently holding up a rifle, with a short bob to go along. While she gave up the sport at a young age, that stylish bob still remains, regal as ever. Another sporty princess, the Princess of Alvar, Bhubaneshwari Kumari an Indian Squash legend between 1977 to 1992. This athletic royal chose to don the classic bob cut through her illustrious life, providing her the ease on the court and chicness off it. Princess Mriganka Singh of Kashmir who recently tied the knot, looked stunning at her wedding, pulling off a saree and edgy short hair to go with it. The pixie not only lends her charm, but also the lithness to effortless style while pursuing her passion like polo and riding bikes. *These personalities do not endorse the organization/brand which sponsors the website.